Cement manufacturing mainly uses electricity to crush and grind raw materials, to transport large quantities of gases and materials and to grind cement. Continuous improvements to the production process will lower the amount of electricity used. Deploying Carbon Capture technology could increase electricity consumption by 50-120%. Cement production requires electrical power at several stages, from crushing of raw materials over clinker production and cement grinding. Replacing older plants with more modern and efficient technologies and continually modernising existing plants will result in improved electrical performance. For example, the application of enhanced grinding techniques and waste heat recovery processes, as well as the use of modern clinker cooler technology and variable speed drives will reduce the levels of electrical energy required. Equipment in existing cement plants is continually modernised, meaning that after a period of 20-30 years, most of the original equipment has either been replaced or modified (e.g. preheater cyclones, clinker cooler, dedusting equipment). Measures that increase thermal efficiency often need more electrical power. For example, installation of modern grate coolers yields a reduction in thermal energy use, but increases electrical energy consumption. Lowering limit values for dust emissions also requires more power for dust separation, regardless of which technology is applied. Reducing levels of other pollutants (like NOx or SO2) will necessitate use of additional equipment consuming electricity. 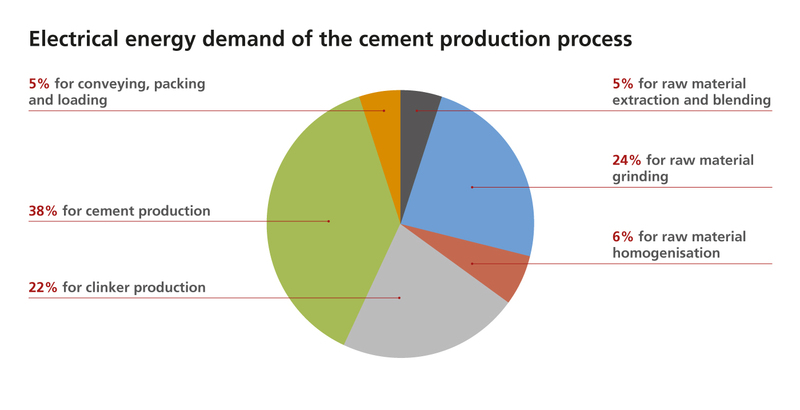 Furthermore, if Carbon Capture & Storage were to be applied on a large scale, the power consumption of cement manufacturing could increase by 50%- 120% at plant level1. Cement performance has an important impact on power consumption. Indeed, the higher a cement’s strength development potential, the finer it has to be ground, and the greater its specific power consumption2. Furthermore, the production of certain cement types that use hard to grind by-products, such as blastfurnace slag, also requires more electrical power. As a whole, European cement plants are very energy efficient and a fundamental change in current cement-producing technology, with a view to achieving a significant reduction in electrical energy consumption, is unlikely. Nevertheless, it has been estimated that by modernising existing plants, replacing older plants and constantly introducing innovations, average electricity use could be further reduced. The model included in this roadmap assumes a total decarbonisation of the power sector by 2050 and all measures that will be taken to reduce our electricity consumption do not have an impact on the carbon profile of the calculations. Nevertheless, in a bid to increase its competitiveness, the European cement industry continuously strives to reduce power consumption and will continue to do so. Provide access to R&D funds to stimulate breakthrough technologies. For example making grinding more efficient. Integrate access to and development of public and private financing mechanisms in all policy initiatives allowing a faster market delivery of existing and new technologies. Ensure European industries have access to electricity at fair and affordable price levels (including taxes and fees), which means a liberalised electricity market is crucial.